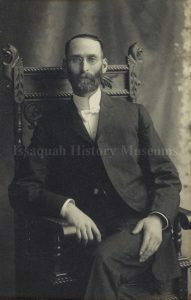 Dr. William Elry Gibson was a well-known personage in early Issaquah. He served several terms as Mayor. 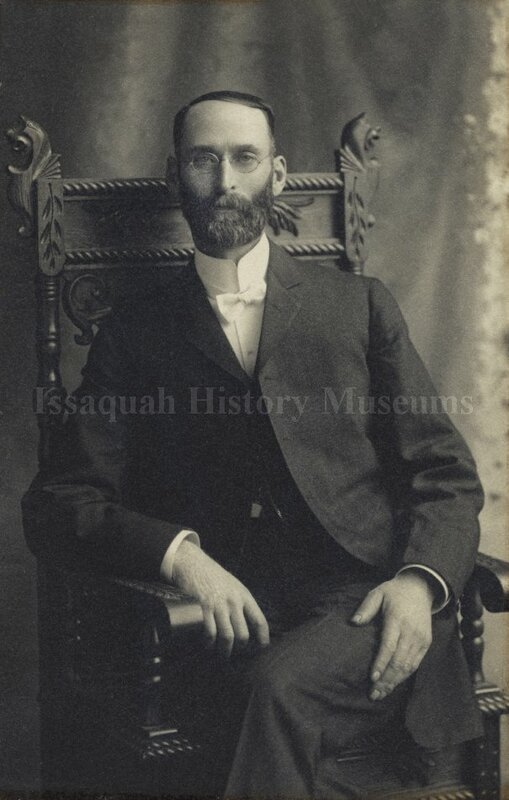 Dr. William E. Gibson is a frequently mentioned personage in Issaquah’s history. He was born in Pennsylvania in 1859, and moved to Iowa with his family in 1866. After completing his medical training, he married Sarah Garner in May of 1888. He settled in Gilman in 1889, where he opened a medical practice and acted as the local physician for the Northern Pacific Railroad Company. Gibson was also active in town politics. He served on the Town Council, and he was the Mayor from 1900-01, 1906-1913, and 1921-1924. Dr. Gibson was known for his interest in horticulture. The gingko tree at the southeast corner of Front Street and Andrews Street was planted by Dr. Gibson around 1900. Dr. Gibson was also recognized as a skilled medical practitioner, uniquely suited for the challenges of working as a small-town Doctor. His role as the sole (for many years) doctor in the isolated frontier town meant that he had to travel a large territory and attend to a variety of medical problems, from delivering babies to patching up gunshot wounds to dealing with a smallpox outbreak among Native American hop pickers. Dr. Gibson died in 1945, at the age of 86. He was buried in Hillside Cemetery. There are still a few folks around Issaquah who were delivered by Dr. Gibson. “Doc Gibson was the first doctor that came here to Issaquah… And he had a big district. He had Carnation, and he had the upper valley, and down to the lake, down Inglewood, and North Bend, Snoqualmie and Fall City. “He had two chestnut sorrel horses that he used to ride. He went night and day, any time, over all that district. There were a bunch of shingle weavers, and they got cut pretty regular. They’d cut their hands and cut their fingers. Sometimes, they lost their arm. Doc had a chair that he used. He put them in that chair, then he’d look around out on the street to get some young fellows to come and help him. Some of them couldn’t stand the sight of blood or anything, and they’d run. “But he’d get about four of us that he used to get a hold of the patient — some of those fellows was pretty husky and strong, you know – and he’d strap them in that chair, strap their legs and strap their arms, and he’d start to work on them. I helped him quite a few times. And he always gave me the ether cap [chuckles] to put on them. As they’d go out, they’d struggle pretty hard. And boy, they’d make the old racket and he had the other three fellows to hold them in till they got enough ether to be quiet. He’d watch them and he’d tell me when to take the ether cap off. And when they’d begin to come to again, he’d say, “Well, you better put it on again.” He never got excited. He never got nervous or anything. “Didn’t have many tools to work with. He’d trim up their fingers, and cut the flesh back and saw the bones off and put the flesh on. And he took four stitches, two one way and two across. “Once he had one great, big guy, his name was Bozo… And he was a very powerful man. In fact, he cleaned up a whole bunch of fellows one night. Three of them was going to pile on him and he had them all laid out on the floor. [laughing] But he was the hardest one. Boy, he pretty near turned the till over and everything else, with three fellows holding him. I had the ether cap on him, and finally he got quieted down. Doc fixed him up. He took off the end of two of his fingers. “Then, there was the train. There were three men at different times fell off the big trestle here out of town and he took care of them. One fellow got his foot in between the railroad coal train and the couplings, the old-style couplings, and smashed his foot up… Doc Gibson fixed up his foot. “And he had lots of outside calls away from home. He went up to Cedar Falls, and he went to North Bend. And one time, he went up to the Goldmayer Hot Springs. He rode his horse to North Bend – awful fine horse – and then he changed there. He got a fresh horse and he went up about 30 miles, in the night. He got up to Goldmayer Hot Springs and he took care of Mrs. Goldmayer. And then he went back through North Bend, he got his own horse and started home. Well, he hadn’t had any sleep for, oh, two, three days and nights. It was long, hard riding, and it was summertime. Well, when he got out here about four miles from home on the old Immigrant Road, he fell asleep on his horse. Fell asleep and fell off his horse. “So he seen he couldn’t go no more, and he tied the horse up. He always had a big overcoat, and a satchel in one hand and the lantern on the other hand. It was about four o’clock in the morning – he pulled the overcoat tight over his head and laid down to sleep. “Well, he went to sleep and he didn’t wake up till the next day about eleven o’clock. And it was summertime, and the sun was straight up, you know, [chuckles] and he hadn’t made it home. He was all wringing wet [laughing] with sweat, but he says, “I got a good sleep!” Anyhow, that was his experience on that trip. “He used to go to Fall City a lot. There’s be a great salmon run at the Raging River there – there was an awful lot of salmon there at that time and there was lots of Indians there – and they used to get feeling poorly. After the salmon run, there’d be a mild epidemic of diphtheria. Doc Gibson, he thought it was caused by so many decaying salmon along the banks of the river. And, of course, the Indians, they drunk that water, so he figured that was the cause of it. And then the many of the whites got it. Many of the whites had it. And they didn’t have an inoculation for that. “Almost all the young Indians about 14 years of age up to the older ones, was all scarred around the throat – great, big scars – and some reached up to the ears and along the side of their face from this diphtheria. He had quite a fight with that.